Most gardeners have a favorite season, a favorite month in the garden. For some it is much earlier than May, before the heat of summer sets in. For others it is October, the fall, though one wonders why. For me, it is no secret that my favorite month in the garden is May. Each day of May brings more flowers, more warmth, more blue skies and a thousand shades of green. Every month of spring before now was just a prelude for this grand show we call May. Here in Indianapolis, we start off May in high spring and end it with the beginning of summer. In between, we see average daily high temperatures of 72 F. We'll have, on average, more rain in May than in any other month. But in between those days that bring us an average of 5.05 inches of rain, we'll have plenty of sunny days, days to enjoy the garden. In May, one can hardly imagine winter, one can hardly imagine dry, hot summer days, one can hardly imagine not gardening. "All year I dream of the days of May, when the sun is warm, the sky is blue, the grass is green and the garden is all new again." I love May too (in part because its my birthday month), but mostly because all in the garden is fresh and green and new - so full of life and promise. And a Merry May 1st to you! I have planned to leave work early to go up to my garden tonight... Just an overnight stay, but May deserves that as a celebration, I think! Reckon I'm partial to May 1st as well since its my birthday. Happy May Day to you as well, Carol. I am with you. It is typically the month of perfect conditions before the wrath of summer heat is upon us. I hope you enjoy your month in the garden and get lots of gardening time in! One cannot be a gardening blogger without thinking of you today Carol. I do love May but this first day has come it with much rain. I think we shall get April showers in May. That is fine....all is so green with showers. Enjoy this month. What a lovely photo at the end, well done! May is okay here, but April is the equivalent of your May in Southeast Tennessee. Enjoy it! I'm already in love with this May because it brought a lovely soft rain- and a May basket! I love to see May come too. It means the end to frosts and freezes and time to get some annuals and veggies growing in containers.Happy May Carol. Happy May! It is my favorite month as well with gardens coming alive with color and hopes of what is to come. Carol, Happy May! 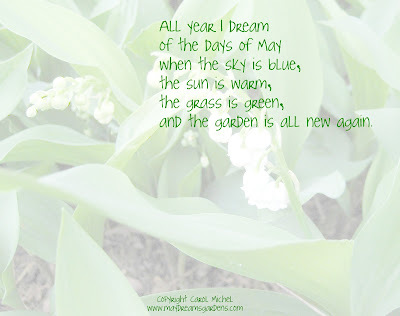 Since I have began gardening a few years ago and reading all the blogs, May has become my favorite month, too. Looking forward to hearing your updates throughout this glorious month!